Trump: Why didn't 'Samurai Japan' shoot down N. Korea Missiles? A perplexed President Donald Trump once noted that he couldn’t understand why Japan, a country of “samurai warriors” did not shoot down North Korean missiles, according to reports. The U.S. leader’s opinion has been lambasted as ignoring the technical difficulties and potential ramifications of shooting the missiles down, or of making such an attempt. The former reality television host pontificated about Japan’s decision not to down the missiles, which were test-launched on Aug. 29 and Sept. 15, during meetings and phone calls with leaders from Southeast Asia over recent months, according to unnamed sources cited by Japan’s Kyodo News Agency. Japan’s military didn’t try to intercept the missiles due to their judgment – based on a monitoring of the missiles’ trajectory – that the projectiles wouldn’t land on Japanese territory, as well as an observation that the speed and altitude of the missiles would make such an interception extremely difficult. “Every once in a while, in the past, they underestimated us. It was not pleasant for them, was it? It was not pleasant. We will never yield, never waver, and never falter in defense of our people, our freedom, and our great American flag,” Trump said. “We dominate the sky, we dominate the sea, we dominate the land and space,” he added. Abe, along with a large portion of lawmakers from the ruling Liberal Democratic Party-led coalition, adheres to the ideology of Nippon Kaigi, a group that openly extols the bloody policies of World War II-era Imperial Japan. The group counts in its ranks prominent businessmen, bureaucrats, academics and politicians. Throughout the 1930s and ’40s, the Imperial Japanese Army and Navy waged aggressive wars across Asia that claimed tens of millions of civilian lives in pursuit of expansionist attempts to conquer the region. 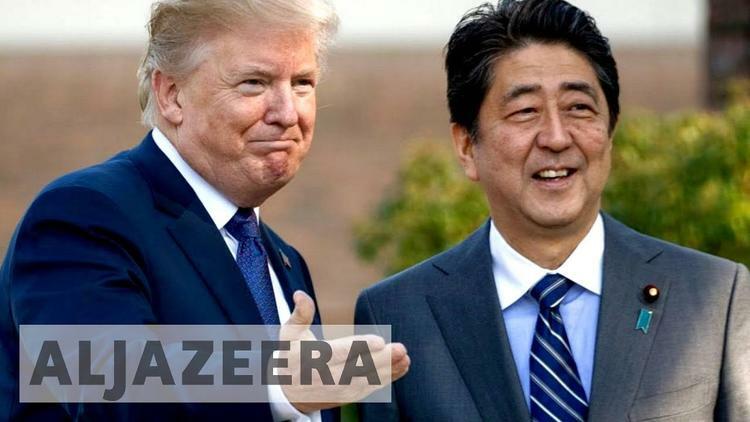 The U.S. has supported successive Japanese governments with arms sales and political support, a policy reaffirmed by a hawkish Trump administration intent on enhancing the U.S. military presence in the Asia-Pacific region alongside a strong ally such as Japan.